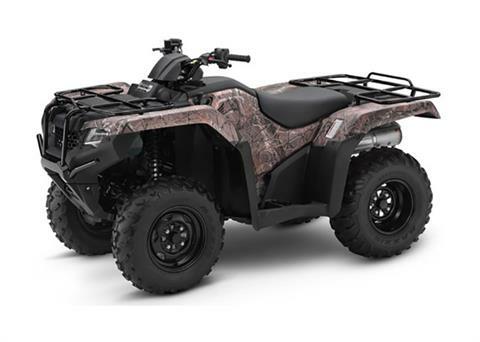 ELECTRONIC POWER STEERING (EPS): Electric Power Steering helps eliminate bump steer and lessens steering effort, especially over rocks, logs and on sidehills. Honda’s system is second to none. There’s no pump, belts, or hoses to fail. Plus you get more boost when you need it: when you’re in four-wheel drive, at lower speeds and in rough conditions. ELECTRIC SHIFT PROGRAM: The convenience of push-button shifting with the rugged design of a conventional ATV transmission—that’s what you get with Honda’s exclusive Electric Shift Program (ESP). Just push one button to upshift and one button to downshift. It’s a big plus when you’re wearing heavy work boots or overshoes, or riding in mud or snow. An added benefit: you get genuine compression braking for better speed control when operating in steep terrain.